(http://mo-germans.com), Agnes Stahlschmidt and the homepage owner. Please click on “Paul” to read his introduction and on Patriot_Article_2014 to read the translation of the corresponding newspaper article regarding a visit of team members in the Sauerland. A link to the original newspaper article is to be found in chapter “Warsteiner deutsch”. For the time being, we can trace the Warstein Stahlschmidt back to Jodocus and his wife Elisabeth Seissenschmidt who get married about 1742 in Warstein where at least six children are born to this couple (see descendants list Stahlschmidt_Warstein_en). Jodocus dies on July 2, 1762. 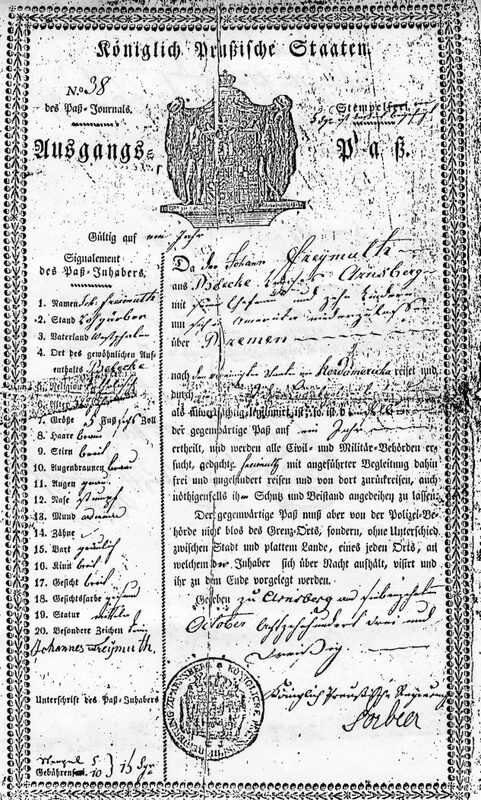 His grandson Joseph marries for the first time about 1812 Elisabeth Raulf, who passes away on August 25, 1824, after having given birth to at least five children. 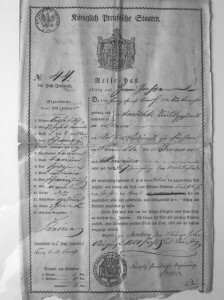 On November 27, 1824, only three months after Elisabeth’s death, Joseph remarries with Wilhelmina Schulte, daughter of Jacob Sch. and Maria Elisabeth Struff. Four children are known of this second marriage. 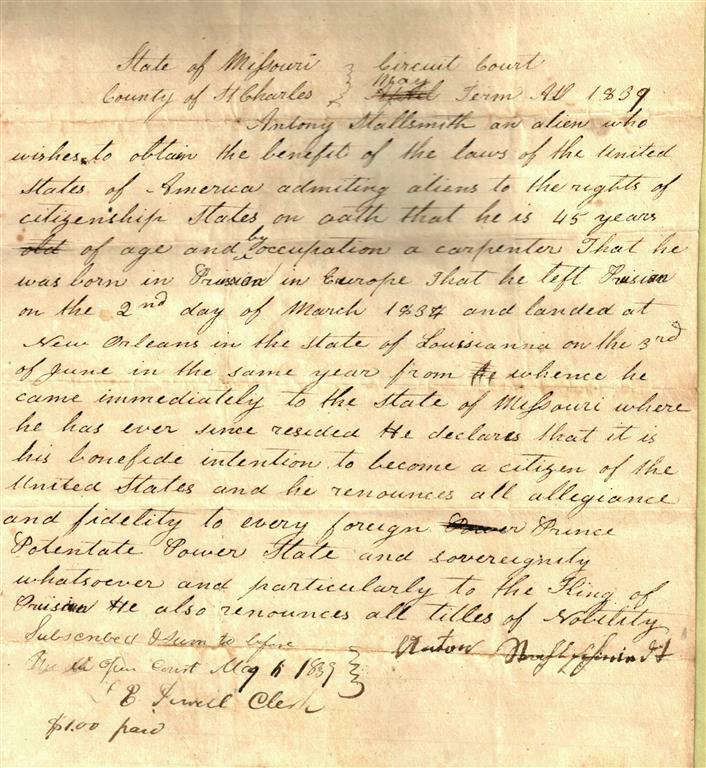 In 1837 Joseph emigrates with his family on the “Moscow” to the United States of America. 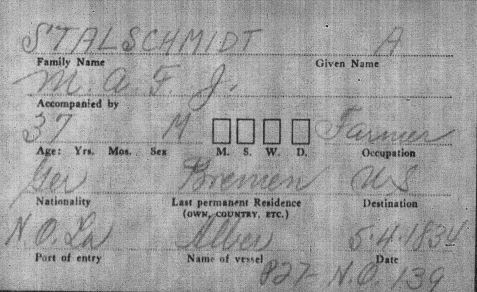 Unfortunately, we don’t know yet when Joseph’s son Adam, born in 1816, comes to America, as he is not on the passengers list of the “Moscow”. 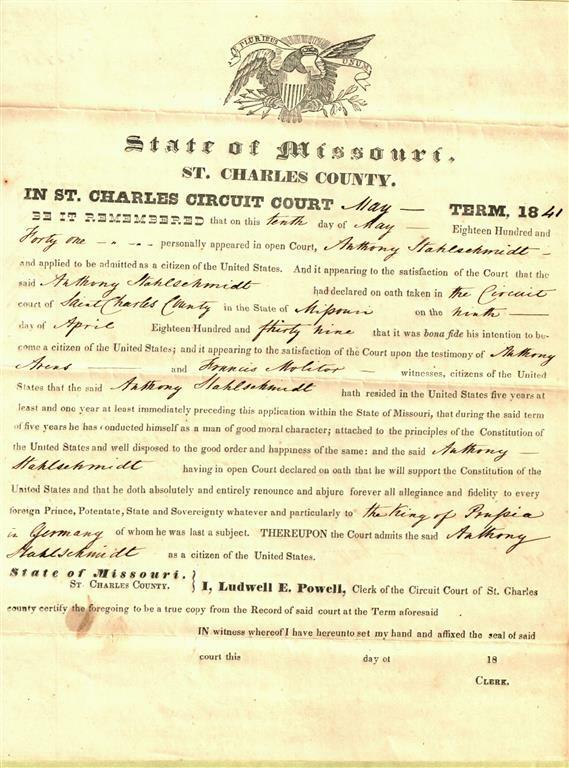 He definitely walkes down the aisle on Februar 14, 1840 in St. Charles, Missouri, with Agnes Freymuth, born in Belecke in 1819 as a daughter of Johannes Freymuth und Elisabeth Loebbecke, whose family already comes ashore in June 1834 on vessel Olbers (see also sub-chapter “Adam”). 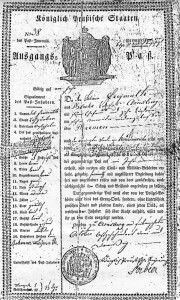 Anton Stahlschmidt, Joseph’s brother from Warstein, son of Henrich St. and Antonetta Pingel, and his wife Sophia Kühle, born in 1801 in Sichtigvor, as well as his three children are on the “Olbers” as well (see extract of the Olbers passenger list and a document issued on Anton’s arrival). 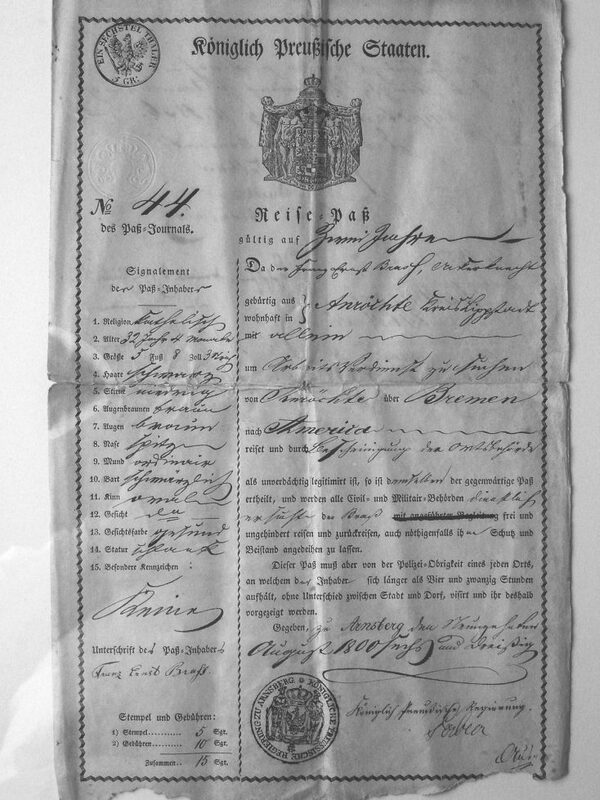 The following emigration passport, valid for one year, issued in Arnsberg on October 17, 1833 for the tanner Johann Freymuth, his wife and ten children as well as the two years valid passport issued on August 19, 1836 for the plowboy Franz Ernst Brass born 1804 in Anröchte have thankfully been placed at team member Heinz’ disposal by descendant Joan and his husband Joe Carter from the United States. Five years after arrival in the United States Anthony declared his intent to become a citizen. 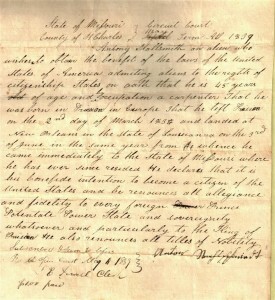 He was granted citizenship on 10 May1841. 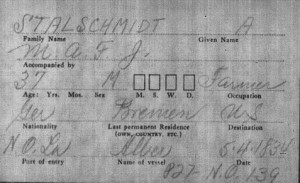 Joseph’s final identification is outstanding due to the lacking church book entry of his first marriage with Elisabeth Raulf. The before mentioned Anton is team members Lorayne’s and Paul’s great-great-grandfather! When clicking on Diagram_Stahlschmidt-Warstein_V8-1 a document elaborated by team member Heinz is showing the current status of our research (birth and baptism date have not been distinguished). When clicking on map you will see where many of Anthony, Joseph and Adam Stahlschmidt’s descendants live, and if the link cannot be opened without password, this Map will show the places as well.